Stephen Frears belongs to a longstanding British tradition of protean film, stage, and TV directing. He is a “service entrance” director who foregrounds script and performance; the quality of his work completely depends on the material and cast. 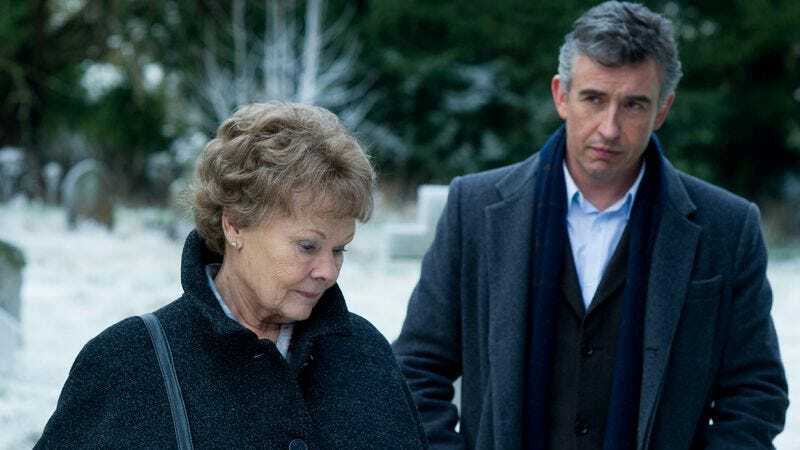 Philomena marks his first collaboration with Steve Coogan, who’s worked extensively with Frears’ like-minded (though more adventurous) contemporary Michael Winterbottom. Adapted by Coogan and Jeff Pope from the 2009 non-fiction book The Lost Child Of Philomena Lee, the moviestars Judi Dench as the title character, a retired Irish nurse who is trying to find the son she gave up for adoption 50 years earlier. Dench inhabits the role. Her “Phil” is flinty, but guileless. She recites the plots of her favorite romance novels to anyone within earshot, but doesn’t hesitate to call someone a “feckin’ idiot” when they deserve it. Martin Sixsmith (Coogan), the author of The Lost Child Of Philomena Lee, acts as her foil. A former Labour Party spin-doctor angling to get back into journalism, he pitches Phil’s story to a magazine editor as an article about “evil nuns.” (Phil, an unwed mother, gave birth in a Catholic convent and then spent four years in its workhouse.) What Martin finds is far from a straightforward human interest story; it involves covered-up deaths, the Catholic Church, destroyed documents, a for-profit adoption ring, gay rights, the Reagan administration, and actress Jane Russell. Playing prickly, insensitive media figures is Coogan’s specialty, and the film pitches Phil and Martin as a couple of mismatched social blunderers; his faux pas tend to be snobbish (acting dismissive, snapping at waitresses), while hers are naïve. But for all of its road-movie character comedy, Philomena is essentially about how a person reconciles their faith with an organized religion’s misdeeds, with Phil as the Catholic-in-crisis and Martin as her atheist observer. This is where the movie finds its most moving moments (accompanied, invariably, by Alexandre Desplat’s twinkly score), and also where it takes its biggest stumbles. Conveying the nuances and contradictions of faith is tricky, and Coogan and Pope’s script (and, by extension, Frears’ directing) is much better at handling Phil’s values than the nuns’ hypocrisy. The movie’s use of flashbacks tends to be heavy-handed, and Frears’ decision to shoot them in grainy Super 16mm often gives them an unintentional exploitation-movie flavor; it also has the effect of making the rest of the movie, shot in a digital palette of browns and green-grays, look flat. Still, that doesn’t detract too much from what Philomena manages to accomplish: a sober consideration of how ideals relate to institutions—whether they’re religions or political parties—anchored by two well-rounded, funny lead performances.